Tea time is, literally, the best time for any individual to have during the day. Sometimes, life can get in the way and we just don’t have time to wait for our cuppa to brew! What is a tea lover to do? Designed to make tea lovers swoon with joy, this brilliant Tea Infuser Blue lets you brew loose or bagged tea on the go just the way you like it. Just lower the drop-down infusion basket for steeping and raise it back up when it’s just right. 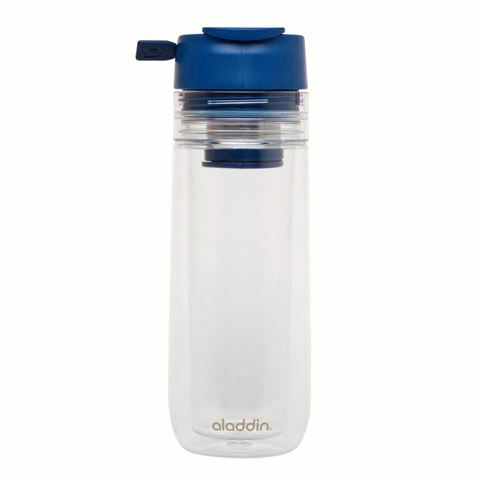 The leak-resistant lid has a notch for tea bag strings, and the double-wall insulation keeps your drink plenty warm and your hands perfectly comfortable. The body is microwave-safe, and the whole kit and caboodle goes in the dishwasher for effortless clean-up. Now you can have your tea your way, on the commute, at work or wherever your day takes you. We're so smitten with this tea infuser, we've even come up with a rhyme to celebrate. We won't mind if you sing along! Flippity ippity flip, it’s time for tea to take a dip. Infuse away, then sip all day, Aladdin’s made tea a cinch! Both jug and lid are made from BPA-free durable materials. Suitable for loose tea leaves or tea bags. Drop-down infusion basket for loose-leaf tea. Built in notch for tea bag strings. Double walled insulation will keep tea hotter for longer. Side lever on lid controls the infusion basket. Dimensions: 7cm (l) x 22.5cm (h) x 7cm (w).